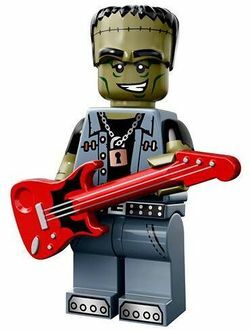 Monster Rocker is a minifigure released in 2015. The Rocker Monster's headpiece displays an extended eyebrows, a sewn-up forehead and black hair. His face is olive green. He has thick black eyebrows over his black eyes that have a white pupil in them. The Rocker Monster has an earth green shadow above his eyes and earth green bags underneath. The Rocker Monster has earth green cheekbones and a smile that shows him gnashing his white teeth. The Rocker Monster's torso portrays him wearing an open sand blue open jacket. The jacket has stitches in the top corners, an outlined collar and round buttons going up the left side. The Rocker Monster wears a black t-shirt underneath his jacket. He also wears a lock with silver chain over his t-shirt. The Rocker Monster wears short black sleeves which are ripped at the end. The rest of his arms and hands are olive green. The Rocker Monster's legs are mostly sand blue. He wears a black belt with silver buckle. The top corner of his legs have stitchings to represent pockets. He wears silver shoes with black outlined bolts. The Monster Scientist created a Monster but accidentally gave him a love of music which created the Monster Rocker. The more he plays his guitar the more electrity he generates. All the monsters enjoy his music. This page was last edited on 13 January 2016, at 07:26.